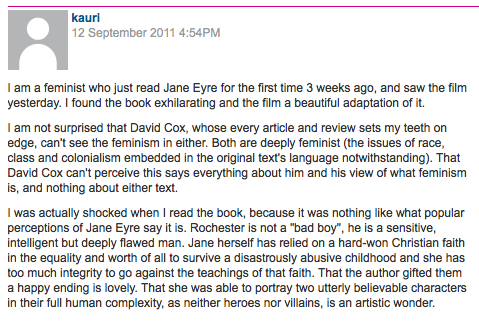 So, of course, I am haunting the Guardian's books pages. There was this extremely interesting article about 'the rise and rise of Brontëmania', for one thing. It talks about the response of the Victorian public to the novel, about the myths and realities of lives of the Brontë women, and about the mysteries that still surround aspects of the Brontë legacy. Then there was this opinion piece with a 'Clever' Pun in the title: 'There is no Eyre of feminism about this modern Jane'. In both cases, however, it's almost as interesting to read the comments as it was to read the articles. 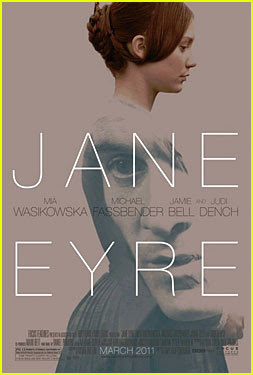 One of the fascinating things about the novel Jane Eyre is its capacity to produce completely different interpretations from different people. In some cases, I would argue they've misunderstood what Charlotte Brontë intended; in other cases, I love that instead of sledgehammering us over the head with a moral-of-the-story, Brontë allowed us to make up our own minds, and this breadth of opinion is a marker of that. I have no idea when I will get to see the film, as I am currently disastrously short on cash, but the film will be seen! And it will be reviewed on this blog!